Food served with or on any type of bread product just makes me happy. Especially when it’s a crispy flat bread with salty and savory toppings. You can cut this up into small pieces for appies but I prefer it as a meal with a simple salad on the side. Zest the lemon and chop rind finely. Season salmon with salt, pepper, half of lemon zest, juice of half the lemon and olive oil. Bake the salmon covered @ 350 F for 8 minutes and then slice into bite sized pieces. 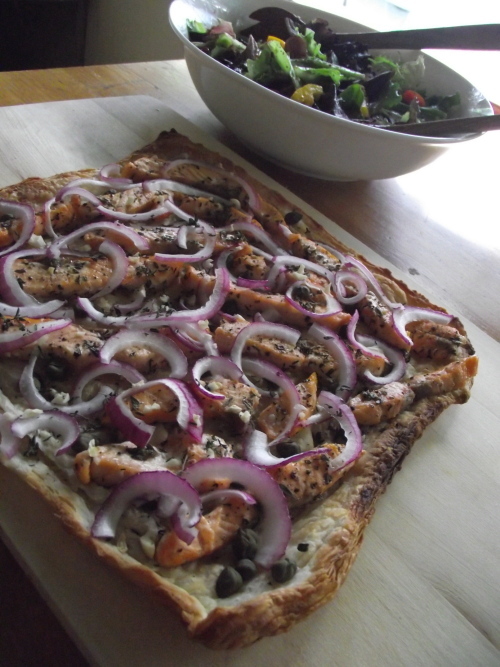 Brush flat bread with cooking juices from salmon and then top with salmon, capers, onions and remaining lemon zest. Bake @ 350 for 8-12 according to flat bread instructions. Squeeze remaining lemon juice over bread and sprinkle with salt & pepper and fresh herbs and serve hot. 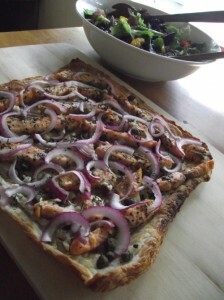 ** if you like your flat bread a little “saucier” than this instead of cooking juices you can also use a thin layer of your favorite creamy type salad dressing or cream cheese as long as the flavor doesn’t overpower the salmon & capers.